Staying at a Heathcote or Bendigo bed and breakfast is a great alternative to hotel or motel accommodation for visitors to central Victoria. Bed and breakfast tariffs are comparable to hotels and motels and yet bed and breakfasts have so much more to offer. River Gardens bed and breakfast at Axedale is situated only a 20 minute drive from both Bendigo and Heathcote. Why tolerate the noise in town when you can enjoy the privacy and comfort of our purpose built B&B farm accommodation. Treat yourself to a few days beside the Campaspe river at Axedale. Guests have told us that the Queen bed in our guest accommodation is the most comfortable bed on the planet. One couple went so far as to say they were going home to buy a new bed having experienced real luxury at River Gardens Axedale. Once you have paid for your room at River Gardens B&B there is no more to pay. You get a cooked or continental breakfast served in your room, on the veranda or in the gardens. Soft drinks and chilled fruit in your fridge are complementary. How about that for a deal? Private entry Bed and Breakfast room includes private ensuite. Breakfast is included in the tariff. Only one B&B room is available so you will be the only guests staying on the property. River Gardens Axedale has something for everyone. Privacy: You will be the only B&B guests staying on the property. Business: Free wireless (NBN). 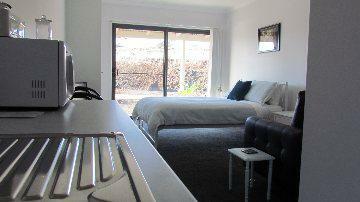 You are welcome to schedule business meetings in your room, in the gardens or beside the Campaspe river. If you have meetings or business to attend to, River Gardens is only a 20 minute drive from both Bendigo and Heathcote. Leisure: Enjoy exploring our 133 acre boer goat and cropping farm. Collect the eggs and feed the goats. Catch yabbies in the creek. Fish the river for cod, golden perch, redfin, trout and carp. Spend a few hours kayaking the Campaspe. There are several islands in the river for you to explore. Visit the wineries of Heathcote and the tourism attractions of Bendigo. In addition to providing an outstanding cooked or continental breakfast, we are happy to provide lunch or dinner by prior arrangement. This means you don't have to leave the property if you don't wish to. Even though you are on a farm, you are only a 5 minute drive from the Axedale Tavern and Coffee House. A copy of their menu will be found in your room. The General Store in Axedale also does takeaway meals. Axedale Tavern and Coffee House. Axedale is situated on the McIvor Hwy just a 20 minute drive from both Bendigo and Heathcote. Axedale has a General Store, Tavern and Coffee House along with a Gallery and Golf Links. Axedale provides access to the Campaspe river for fishermen although the river tends to be shallow around the Axedale township. The river is much deeper just out from the River Gardens Bed and Breakfast. Bendigo in central Victoria has so much to offer. With great shopping, restaurants, pubs and clubs you will be sure to enjoy yourself. Bendigo has several popular tourist attractions including the Golden Dragon Museum, the Central Deborah Gold Mine and the Bendigo Pottery. The Bendigo Jockey Club, Harness Racing Club and Greyhounds all have regular meetings. Harness and Greyhounds are only a 15 minute drive from River Gardens. Heathcote could seriously claim to be the wine centre of Victoria. Producing mainly red wines, the Heathcote district is becoming a popular weekend destination for wine aficionados. You'll find many cellar doors around Heathcote. Heathcote provides a country town shopping experience. Try Gaffney's Bakery in High Street, you won't regret it. For more on Heathcote visit the Tourist Information Centre.